Oh this is a truly exquisite work! A clear case of the best getting even better. 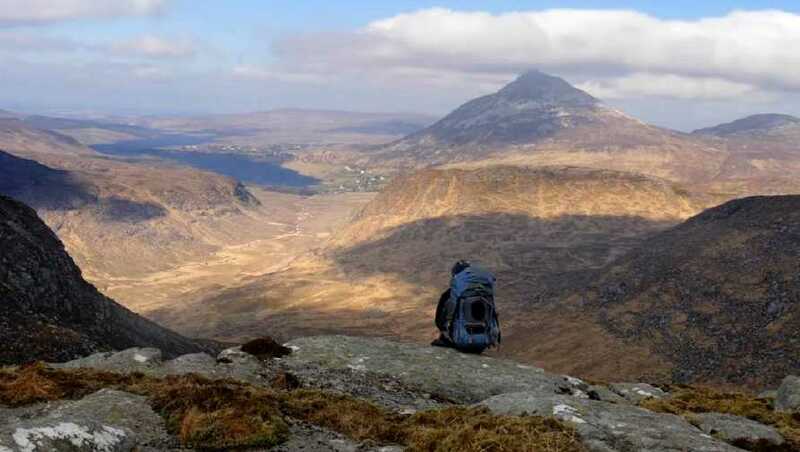 'Wild Ireland': A Two Day Trek and Bivouac in the Derryveagh Mountains, Donegal is the full title and it's a tribute to the wonderful Derryveagh Mountains. "This video, the first in a new series of ‘Wild Ireland’ films, follows a 30 km two day trek and overnight bivouac in the Derryveagh Mountains of County Donegal in mid-March 2015. In the valley close to Dunlewy Lough, the first flush of spring was everywhere: birdsong filled the air, tentative green shoots sprouted from seemingly lifeless brambles, catkins dangled from winter weary boughs and saffron yellow coltsfoot flowers erupted from amid paper dry and ragged yellow grasses like condensed droplets of sunshine. But up on the mountains, where we endured a bitter easterly wind, winter had yet to release its icy grip and on the highest ground, the last snows of winter lingered on. Our tent was silvered with frost, icicles oozed from frozen peat hags, verglas smeared the naked granite and ice-covered bog loughs gleamed like glass in the deep chill of early morning. 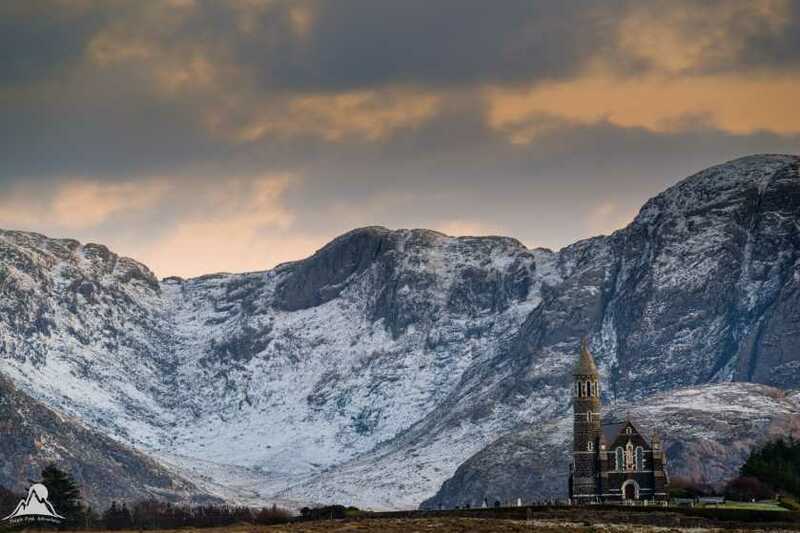 It is possible to do this route, which offers truly joyful walking in one of the wildest corners of Ireland, taking in eight summits and breath-taking views down over the Poisoned Glen, as a circular walk from the excellent Errigal Youth Hostel. For a GPS track of the route see: mountainviews.ie/track/report/2835/ "
I watched this YouTube Video on a large flat screen TV. The standard is well up to the level of mountain documentaries you might see on BBC and RTE. Cnoc Fada was the first stop on a cracking round from Dunlewy, also taking in Drumnaliffernn, Bingorms, Slieve Snaght and Crockfadda NE Top. Parking was at the side of the road just past the start of the track into the Poisoned Glen. The track into the Glen is well worn and passes over a lovely arched stone bridge. At this point Errigal is still ahead with the X Factor but this changes as travel further into the ampitheatre. The ground does get pretty wet, but relativity is all - as i think of the walk into Lough Belshade in the Bluestacks! The grass is lush and green and the walls of rock tower skyward all around. I passed the gully access point to the right and veered left to follow the river dropping down from little Lough Beg. There was a bit of boulder hopping and walking along a surprisingly dry riverbed. On reaching a deerfence i followed this steeply uphill to the right, along the flanks of Cnoc Fada. As i stopped to catch my breath the wind exhaled and whistled through the strands of wire beside me. A couple of merlins flew past furiously and noisily. 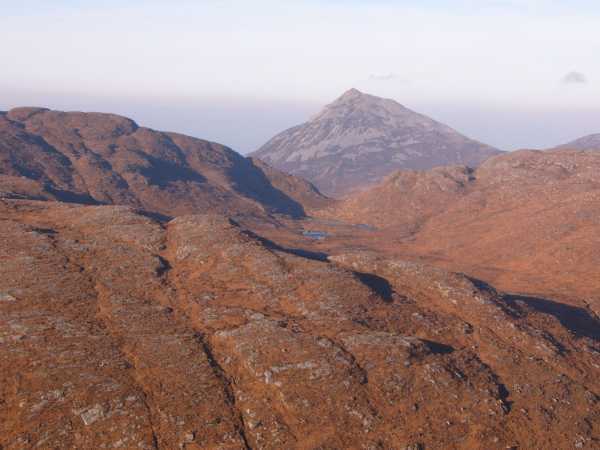 Mackoght now deems to make an appearance alongside the presence of Errigal above the high ground of Maumlack. The whole of the Poison Glen was also laid out before me, back to the ruined church at Dunlewy (wow). The toil uphill is steep and today was slippery. At the crest leave the fenceline and head to the right to reach the 485m of Cnoc Fada after a couple of hours walking. Big big views to the surrounding Derryveaghs - Dooish joining from the NW, Moylenanav to the S and Drumnaliffernn, Bingorms and S Snaght. The ground here is wonderfully rocky and gives a great sense of being in the wilds.